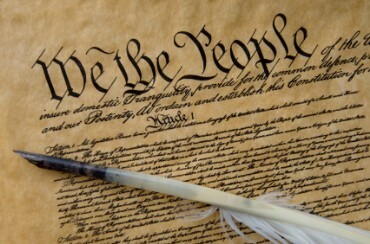 The Constitution is a series of compromises, and not a document of Wisdom Handed Down from Our Elders. In order to get the Constitution ratified, certain concessions had to be made. In part one, I mentioned how many parts were written purposely vague because that was the only way to get agreement on them. Let’s now look at some more clear-cut examples. The most obvious may be “The Virginia Compromise.” (Look, it even has “compromise” in its name.) The smaller states wanted each state to have an equal vote so that they wouldn’t be ignored. The larger states wanted it to be based on population which would obviously benefit them. In the end, we got both — a Senate where each state gets the same representation no matter how small, and a House where the states with more people get more representation. Then there are the first ten amendments themselves (the “Bill of Rights”). Many states refused to ratify the Constitution without these protections, and it’s a good thing they demanded them. But the clearest example of compromise in the Constitution has to do with slavery. Most of the northern states had already abolished it and wanted the entire country to do the same, but the southern states refused. The south was worried that as soon as this Constitution was passed, the northern states would outlaw slavery completely. Without some provisions to prevent this, the south refused to agree to the Constitution. Second, there’s the ridiculous 3/5ths clause. The south demanded that when determining how many representatives they would get in the House, that slaves should be counted as “people” even when they were property in every other respect under the law. The north rightly pointed out how stupid this was, but the south insisted and there was another compromise made. We ended up with a provision that held that 3/5ths of every slave would count. No mention as to which 3/5th of the slave counted, though, but apparently it didn’t include the head since the views of the slaves mattered not. So whenever some Constitutional fundamentalist tries to argue with you that the Constitution is concise and “the will of the Founders,” just point out how many compromises there are in it, thus clearly indicating that there is no “will of the Founders.” It’s all agreements and compromises needed to get the thing passed. Next: A clear, exact 1st Amendment which doesn’t provide for any exceptions, and then all the exceptions there are to it. This entry was posted in Constitution and tagged Constitution, Founding Fathers, Slavery. Bookmark the permalink.